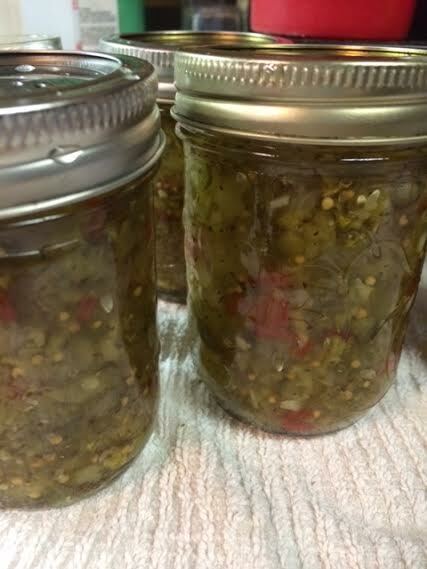 This season, while canning pickles, I decided I wanted to make and can pickle relish. I also knew what I wanted it to taste like. I wanted to it to taste like the relish I buy at the grocery store. I know that may sound odd but I really love the taste. When I need canning advice, I often turn to Sharon Peterson and her website, Simply Canning. When I realized that Sharon had published a canning cookbook, I had to purchase it. I began checking into my canning books and asking friends for recipes but all of the recipes had way more ingredients than I wanted to deal with in making my relish. And then I saw the recipe in my Simply Canning Cookbook. It seemed to be just what I was looking for. Since this book was a recent purchase, I had not thought to look here first, but I won’t make the same mistake again! The recipes are simple and straight forward, combined with a wealth of canning know how and experience. I like the way Sharon wrote the book as it is much the same format I have used in teaching canning classes. Anyway, back to the “perfect” sweet relish recipe. I was a little surprised at how much onion and green pepper were in the recipe because I don’t taste it. Almost every recipe had these ingredients, so I decided to include the onion and peppers. And, Sharon’s recipe had a more reasonable amount for my taste. I made a batch and was very happy with the taste. It was exactly what I was looking for. I wrote to Sharon and asked permission to share her recipe with you all, and she readily agreed. If you are looking for a great guide for canning, I highly recommend that you purchase Simply Canning, by Sharon Peterson. It is available on Amazon by clicking this link. Not only is this book a complete guide to the mechanics of canning, the recipes are very good, too. The perfect relish for hot dogs or hamburgers! Begin by preparing your jars and heating the water in the canner. Combine chopped cucumbers, onion, and peppers in a large bowl. Sprinkle with salt and cover with cold water. Let stand for two hours. Drain well. Press out any excess water. Combine sugar, vinegar and spices in a pot. Bring to a boil and add the vegetables. Simmer 10 minutes Pack into hot jars, leaving 1/4 inch head space. Remove air bubbles, wipe jar rims and place lids on the jars. Process 10 minutes in a water bath canner or according to the directions for your altitude. Rachelle, who occasionally writes for Homestead Chronicles, shared her zucchini relish recipe with us, too. if possible refrigerate over night. Drain well, rinse several times (I wash mine 3x’s) and after the final rinse,press out as much of the water as possible. Thanks Everyone who joined in the conversation! Let us know in the comments how you make your relish. When you say cucumbers, do you mean canning pickles or actual cucumbers for the relish recipe? Thanks, It sounded like a fast simple recipe and wanted to try it, but didn’t want to waste supplies using the wrong product. We also have straight 8 in the garden. Thanks again, I love your site. I just ordered the suggested cookbook and am looking forward to reading it. Do you have a recipe for dill relish that is as tasty as the sweet relish recipe you provided? I’m the only one in the family that like sweet relish and my boys thought I should make them dill relish. Oh wow does this sound good! I’m going to have to try your recipe. Thanks! Thanks for joining us at Green Thumb Thursday! I hope you’ll stop by and link up again this week! For me, relish just HAS to have turmeric. It gives it that almost neon green color of Heinz! Thanks! I’ve been looking for a good sweet relish recipe!! I can’t wait to give this one a try. Now…if only the cucumbers would grow a little faster, I can hardly wait for the first fresh pickles of the season! Pickling salt is just a very pure salt. A Mediterranean sea salt or a fine Kosher salt would work also. Table salt has other things in it and its not a pure, high quality salt. Having said that, I will tell you that I used regular table salt for years before I knew there was a difference and everything worked out just fine. Good luck with your canning! Believe it or not, I have never thought about making my own relish!?!?!?! Hmmmm. LOL Thanks for sharing on the (mis)Adventures Mondays Blog Hop. I can’t wait to see what you share this week! I am actually very surprised! You definitely should try to do this. This looks great! I’m new to canning and an really enjoying it! Does this yield 6 half-pints? I am sorry Kris. I would save the liquid in the refrigerator in case you want to make another batch. I really don’t know why you have so much left over. I just made this recipe tonight and I can’t wait to taste it! How long should we wait to open and enjoy this? And how long would you estimate that it lasts unopened and opened? The pickle relish recipe says ‘yields 6’. is that cups, pints? trying to adjust my recipe for 6-8 half pints. I love sweet relish.. I can handle dill relish but something about sweet relish is just so delicious and I could honestly eat it straight from the jar. I throw it on hot dogs, in tuna salad, and many more things! Thank you for these recipes! I cannot wait to try making my own at home. Really loved the recipe a pleasant surprise at how good it tasted. Very easy, an delicious. This recipe is just like my mothers. 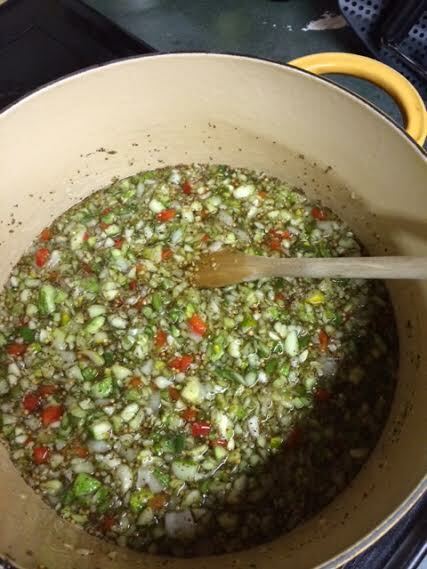 I have been making this relish for 35 years, and get many requests. enjoy! Why did my relish come out so liquid?y. I drained and pressed out excess water. Followed directions. I?m a little disappointed. Please help. HI Amy I am sorry you didn’t get a great result. When dealing with cucumbers and squash it can be a problem to get too much liquid. The smaller chopped vegetable pieces need to be packed in pretty tight in the jar before the brine is added. Is your relish watery or just has too much brine? Thank you for such a great canning recipe!